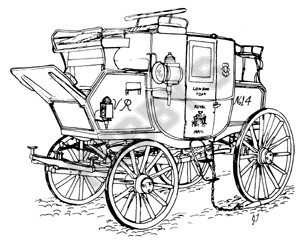 In it's day the Mail Coach was the aristocrat of the road, and all other traffic had to give way to the King's mail. The plans were originally drawn 1/4 full size, so it has been possible to include a lot of fine detail. On one sheet I have provided a set of Royal Arms and insignia, which can be cut out, coloured and glued in place on the model, before varnishing over. General instructions for the modelmaker are also included.